‘The sound of the language is where it all begins. The test of a sentence is, Does it sound right? The basic elements of language are physical: the noise words make, the sounds and silences that make the rhythms marking their relationships. Both the meaning and the beauty of the writing depend on these sounds and rhythms’ (Le Guin 2015, 1). Let’s briefly ponder Le Guin’s words; the meaning and the beauty. This is, as I see it, a large part of what we all aspire to in our work as academics. Writing – a craft – which can meaningfully communicate the knowledge that we, alongside our interlocutors, produce and share. Writing – a skill – that has the power to engage, move, shape, and transcend time and space when tinkered with enough so as to emerge ‘gorgeous’ (Le Guin 2015). Writing is, indeed, a learnt technique – a craft, a skill (Le Guin 2015, ix). Alongside finding meaning and shaping beauty, we are, at many temporal junctures, presented with the (sometimes daunting) task of pouring over, and into, our gathered material. Pages upon pages of fieldnotes, a camera full of photographs, a recorder jammed with videos, stacks of archival photocopies, soundbites and soundscapes, the list goes on. One question, which thus presents itself, is, how do we move from material to an academic text – one, which is both meaningful and beautiful? Having mostly concluded our fieldwork and having worked in the Ghanaian archives, this question is a poignant one for our team. We therefore took the opportunity to, following the larger ‘Teaching/Learning Materials: A Skillshare Workshop’, organise a day-long event entirely devoted to the craft of writing and, specifically, to the initial stage of moving from (mostly) undigested material to a workable text that sits warm and comfortable in the belly. The event created was titled, ‘A Skillshare Writing Workshop’ and took place in Maastricht from the 12th-13th of July. We were extraordinarily privileged to have the time and expertise of Professor Rachel Prentice, Professor Janelle Taylor, and Professor Jeremy Greene, who guided the workshop, introducing and concluding the event, leading the smaller group writing sessions, and generously sharing their knowledge, frustrations, and personal metaphors for their processes of writing (beach combing, sculpture, and slalom). 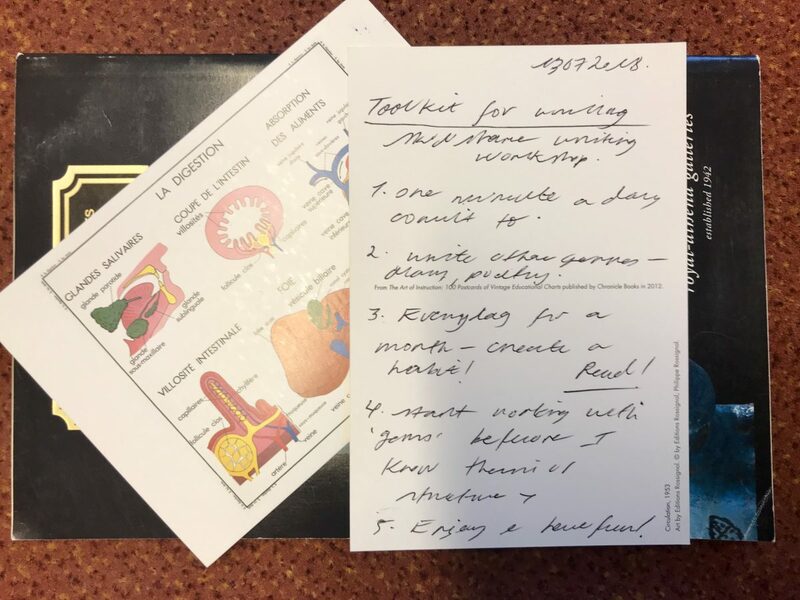 The workshop was shaped by texts from authors Ursula K. Le Guin and John McPhee and was supported by an online resource catalogue complied from a list of suggestions given to us by the participants themselves. Our group comprised 19 persons from varying disciplines and with diverse thematic interests, half of who were senior scholars and half of who were PhD researchers – a combination which lent itself to a fruitful skillshare. Following a wonderful introductory session led by Janelle Taylor and Jeremy Greene and bearing a set of useful tools – postcards, sticky notes, coloured markers, and index cards – we divided into three smaller groups. One writing exercise explored in the small group guided by Janelle Taylor began with a prompt. 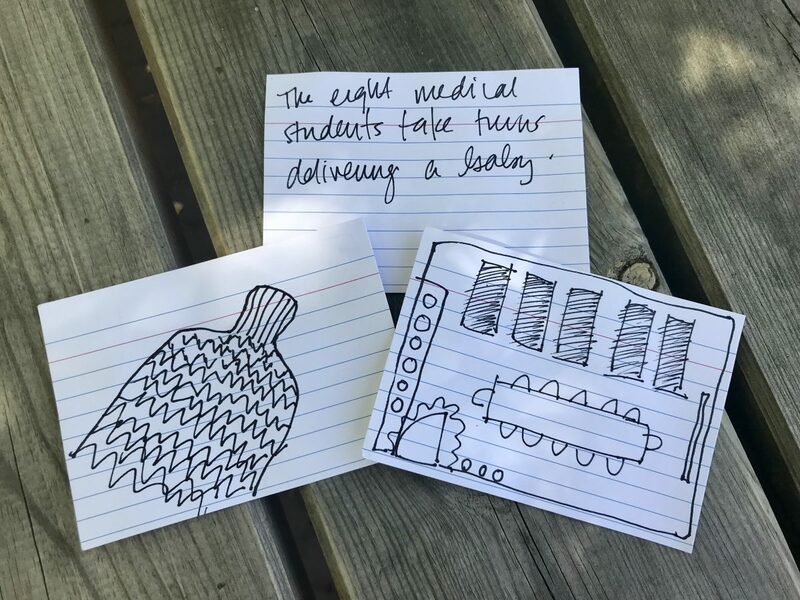 Using three index cards, participants were asked to 1) describe, in a sentence, an exchange of dialogue or interaction from the field, 2) to create a “map of your fieldwork”, and 3) to focus on an object from the field and present it through drawing. These were then the foundations of, and instigators for, the group’s free writing time. Another, more practical suggestion for establishing and sticking to good habits of writing – particularly when perfectionism and procrastination (and perhaps a little fear) set in when properly comprehending the quantity of rich material one has collected – was given to us by Rachel Prentice. One minute of writing every day, no matter what. No excuses, no putting it off until tomorrow, no re-reading articles or pouring over notes, we can all commit to one minute. It may seem a little odd or even unproductive, one minute – what can one accomplish in that time? However, as I see it, the purpose is to make writing friendly and approachable. Sitting down and starting is often the hardest part, one can always fill their day with other productive research tasks. Though, as many of us know, once one begins to write, the joy of the medium – of crafting rhythmic sentences and expressing ideas which we truly care for – takes over and we lose ourselves in the task. A provocation raised in the closing session led by Rachel Prentice was to not only engage with the content of our own, and others’, work but to attend to the language, the structure, and the rhythm of texts in a caring and radical manner. Here, we find ourselves back in conversation with Le Guin’s meaning and beauty. The necessity of playing with rhythm, sound, alliteration, flow (for instance) – of making our writing ‘gorgeous’. 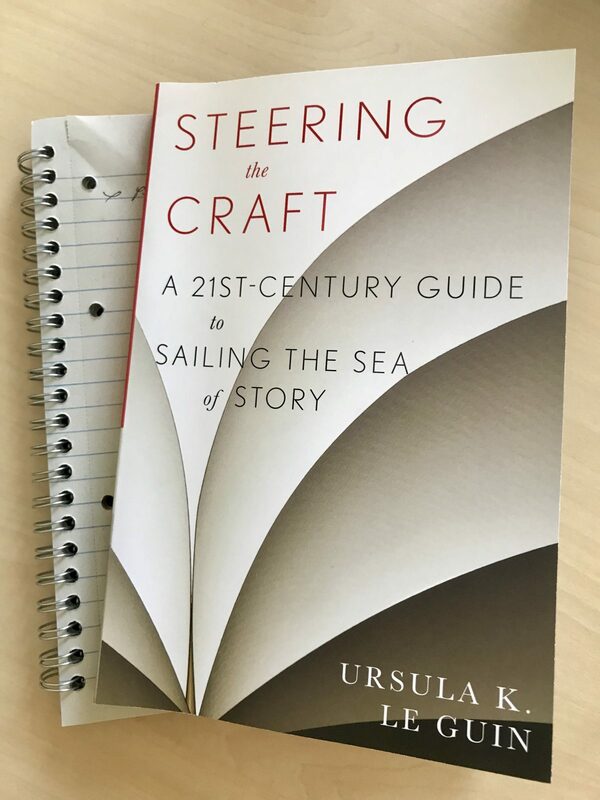 Moving forward our team will be practicing our craft by working through the exercises presented by Le Guin in her book ‘Steering the Craft‘. If you fancy more deeply attending to the meaning and the beauty of your own work, perhaps you could too. Katherine Verdery (2018), ‘My life as a spy’. Sayaka Murata (2016), ‘Convenience Store Woman’. China Miéville (2009), ‘The City & the City’. John Seabrook (2018), ‘Black Ice, Near-Death, and Transcendence on I-91’. Chimamanda Ngozi Adichie (2006), ‘Half of Yellow Sun’. Yona Wallach (1997), ‘Wild Light: Selected Poems’. Urusla K. Le Guin (1985), ‘She Unnames Them’. Thanks to the European Research Council and the Netherlands Graduate School of Science, Technology, and Modern Culture (WTMC) who provided the funding that made this workshop possible.